They say that April showers bring May Flowers but, at High 5 Casino, April brought a shower of WINS to you High 5-ers! 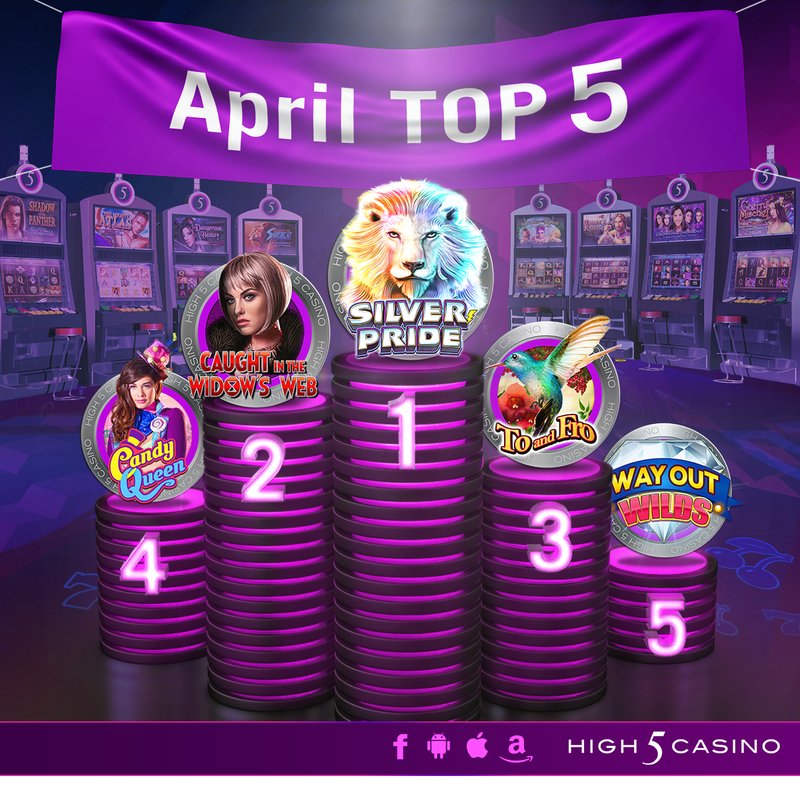 In April, High 5 Casino added FOUR new games to the casino lobby, including our 250th game! Now, High 5-ers are able to choose from 250 different slots! We also continued our weekly themed XP events, introduced new and improved Player Challenges, and added some new tournament games! With our 250th game Way Out Wilds, we launched the 250th Game Celebration! During this promotion, players were able to earn raffle tickets by playing in any H5C slot game available in their casino lobby. Players earned one raffle ticket for every 250 spins and for every 250,000 coins won in a game. With these tickets, players had a chance to win the daily prizes and the Grand Prize! From April 27th through May 2nd, there were a total of 6 winners, each receiving a $250 USD coin package awarded as the daily prize On May 3rd, we announced our GRAND PRIZE winner who was awarded a $2,500 USD coin package! 1. Friday, April 27th – Joseph C. from Pennsylvania! 2. Saturday, April 28th – Wayne W. from Oregon! 4. Monday, April 30th – Joan S. from Minnesota! 5. Tuesday, May 1st- Gloria B. from Texas! 6. Wednesday, May 2nd – Luca G. from Italy! And a bigger congratulations to our Grand Prize Winner, John B. from North Carolina! With all these spin-tastic events April rained in, High 5-ers spent over 3 million hours spinning the H5C reels over 1 BILLION times! Which game gave you your High 5 Moment in April? What did you enjoy most about High 5 Casino last month? Comment in the conversation bubble located on the top right corner of your screen and let us know! 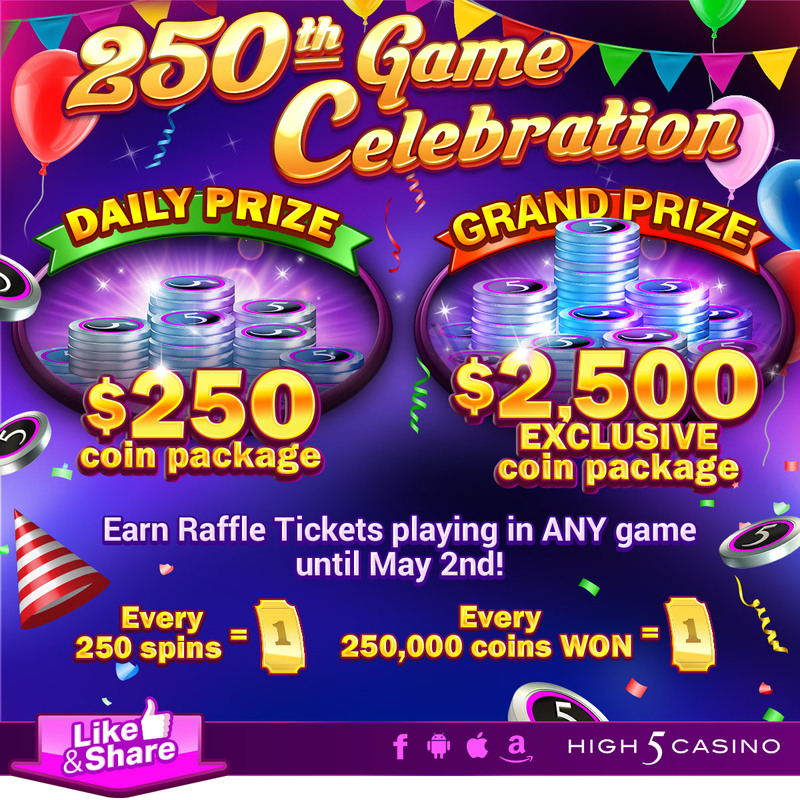 High 5 Casino’s 250th Game Celebration! High 5 Casino hits a major milestone with the release of its 250th slot game, Way Out Wilds. Featuring a fun twist to classic Vegas slots, this new slot game will light up your reels as they partake in this exciting celebration. In September 2012, High 5 Casino first launched with only 14 premium land-based slot titles. By July 2014, the app reached its 100th slot game milestone and its 200th slot game milestone by May 2017. Less than a year later, High 5 Casino has added 50 more new slot games to its vast library! The exclusive 250th slot game to launch at High 5 Casino includes Double and Triple Split Symbols, Locking Wilds, plus a brand new slot game feature, Lasting Loot. The board in this unique slot game gives H5C players many chances to hit the jackpot they seek! Every big win hit is celebrated with flashes of thrilling lights. Along with the release of Way Out Wilds, the 250th Game Celebration also kicks off with the start of an in-app raffle! From April 26th to May 2nd, 2018, players can earn raffle tickets daily by playing in any High 5 Casino slot game, giving players a chance to win a daily coin prize and even a grand prize on Thursday, May 3rd. What games are you going to play in to win your High 5 Casino 250th Game Celebration raffle tickets? Comment in the conversation bubble located on the top right of the blog post to let us know!